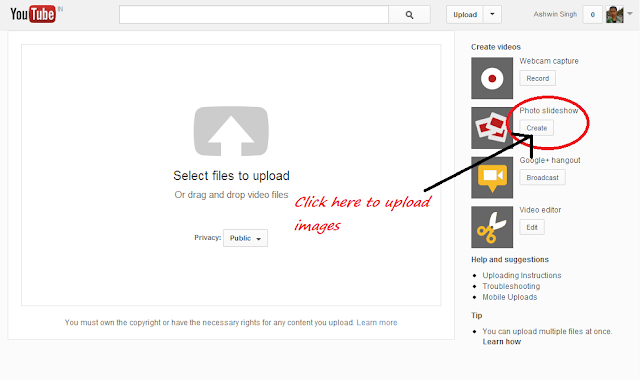 Upload Slideshows of Images to Youtube as Video. Sometimes you have seen videos on Youtube that contain only slideshow of images. 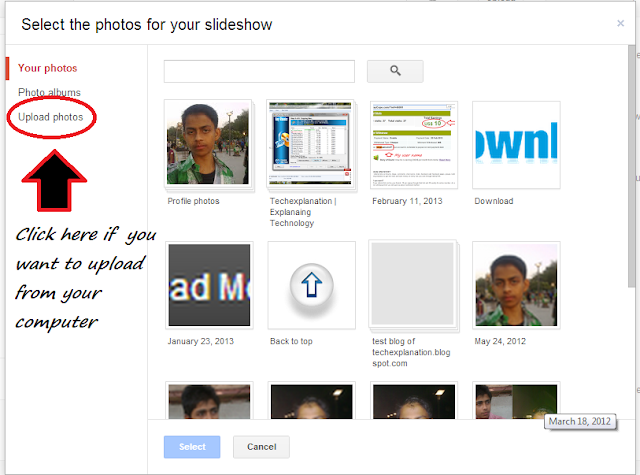 If you want to upload slideshow like that so you don't need to create any slideshow with any software. Youtube will convert your images in a slideshow for you. The old way was to use any software like Windows Movie Maker or Picasa to add images in slideshow. After that uploading on Youtube but here is a new and easy step. New trick to upload slideshow of images. First go to Youtube website and click on Upload button. On the upload page see on Right section of Youtube website there you will find Photo Slideshow.Click on create button under Photo Slideshow. Now a window will bounce where you can upload the Images.There are more option like uploading Images from your Picas album, You can also upload images from Photo album that are uploaded on Picasa web. Now select images or select album. On the next page you can Rearrange photos it means you can select which photo should show First in slideshow and which should show second.After that click on next button. Next page and Last page where you can preview your Slideshow and add a audio in your slideshow. 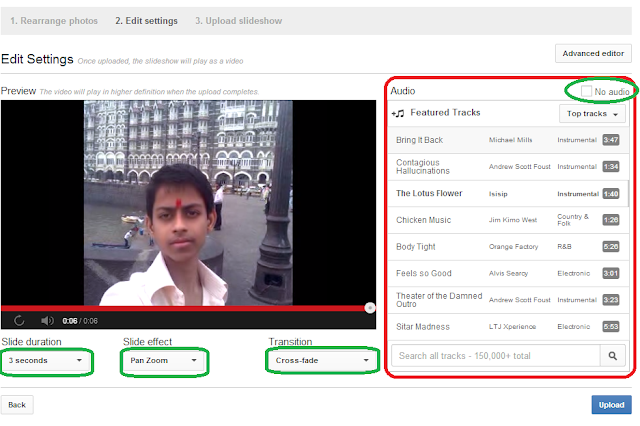 Youtube not allow to upload your audio in your video but you can choose from Featured Tracks. There are many audios to choose from and all the audio are legal. At this page you can also change Slide Duration,Slide Effect,Transition. After this you can upload video in the same way of uploading any normal video.